Macro photography and fractals have a lot in common. I don’t know what that is, but I just sense that they have a “family resemblance”. Imagine you’re trying to put together a jig-saw puzzle but someone has accidentally thrown in another puzzle with it. While looking for the pieces that match up with the ones you’ve already put together you’re also picking out the ones that belong to that other puzzle that don’t belong in the same box. But you also keep coming across pieces that, while they don’t fit in immediately with the small part you’re already assembled, you sense they’re part of the larger complete picture and you want to hold on to them and not put them aside with the pieces of the other puzzle because they look, in some vague and hard to describe way, similar. Haven’t we all zoomed into something like this in a fractal program? This fly’s head reminds me of many of the formulas in Sterlingware. 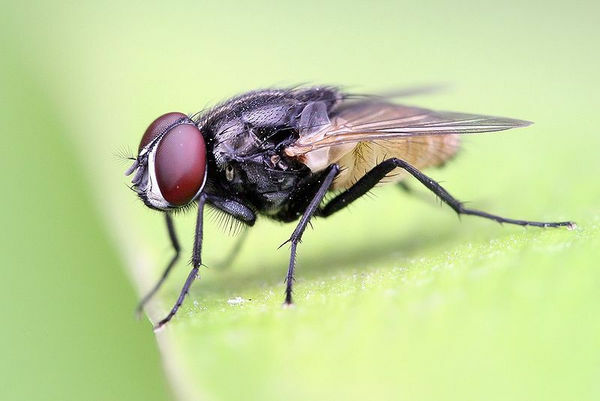 Flies are purely a nuisance when seen at a regular scale but they are both magnificent and terrifying when seen up close. I got these two fly photos off the Wikipedia. This second one here is really a work of art. I like color and I think color almost has a subliminal thought-inducing language and quality all its own. 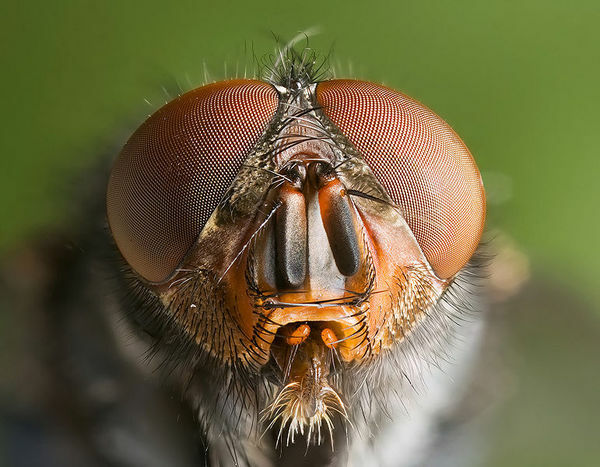 What an incredible machine the common housefly is; no spaceship or aircraft a human could design will ever look as superb as this housefly. 10 Million Year-Old Fractal Found in Antarctic Ice! 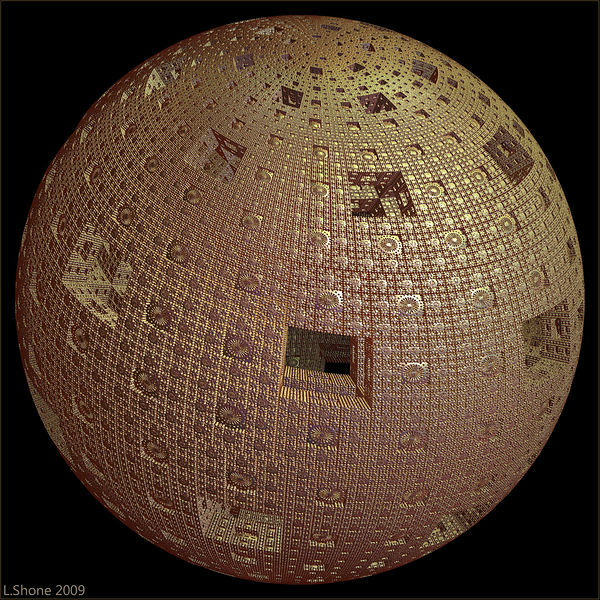 According to a recent article in the Scientific American, some ancient species of molds when allowed to grow slowly and undisturbed for millions of years, grow and develop in patterns that are identical to those formed by iterating fractal formulas with a computer. I just made that up, but that’s what I thought when I saw this image by Jesse in the Fractalforums.com gallery. Great images just make me want to say great things. The facts come later. 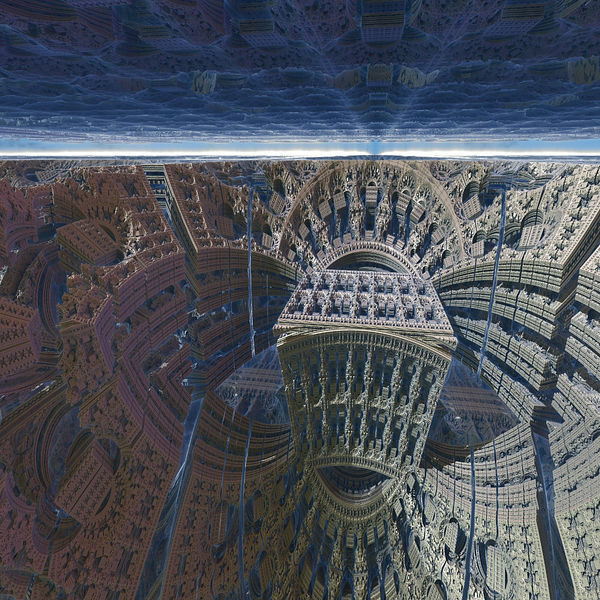 The mandelbrot inside the mandelbox! 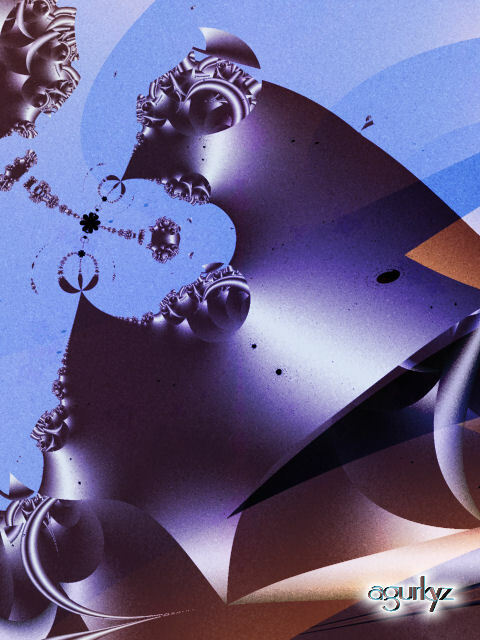 But it seems only natural to find a mandelbrot man inside a mandelbox 3D fractal formula. He lives there. Just like a pearl inside an oyster and it’s shell. 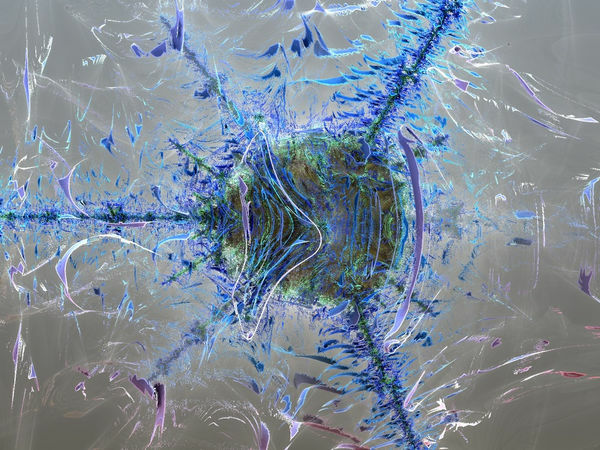 I’ve looked at this image quite a bit and I can’t decide if it looks more like the mandelbrot is being absorbed by the mandelbox, as I think the title by lenord is suggesting, or if the mandelbox is actually growing out from –and growing off of– the mandelbrot just like a plant grows out of a seed. Lenord’s got some other ones like this and they have the same interesting combination of old and new fractal designs. Apparently it’s all from the same formula and not from layering or some sly photoshop trick. 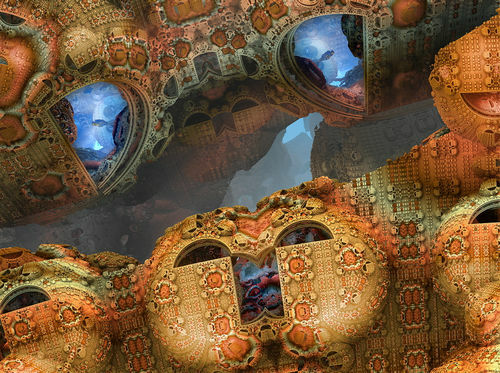 New people are always popping up over at Fractalforums. Fractalforums seems to be where all the action is lately. I don’t know who any of these people are (and they don’t know me) but I don’t really need to know them when I can just look at their work and judge it for itself. Tatty has really come up with something new here. So much detail and such variety of it. 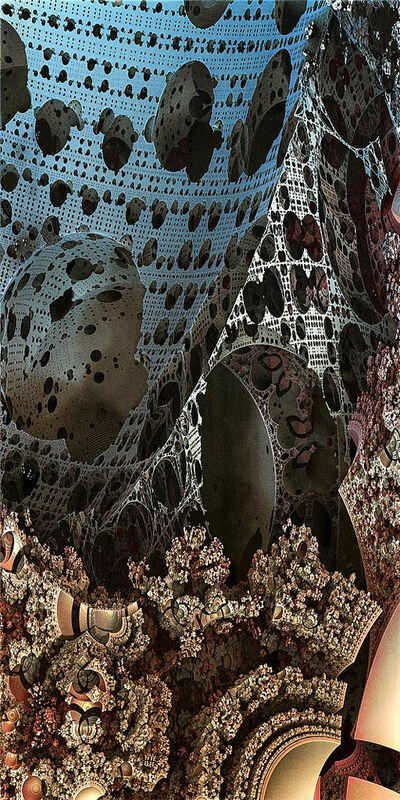 But it doesn’t look like a mandelbox or mandelbulb to me and yet it has that 3D look to it. Could there really be some new thing called a “Kractal”? Another by Tatty. Already she’s developing some noticeable style just in these two images. There’s a wide variety of shapes and yet they complement each other instead of clashing or looking pushed together. Subtle and with good coloring too. Box 1? If this is just the first she’s off to a great start. Tatty has a good eye for the sort of pleasing organic shapes that fractals excel at. 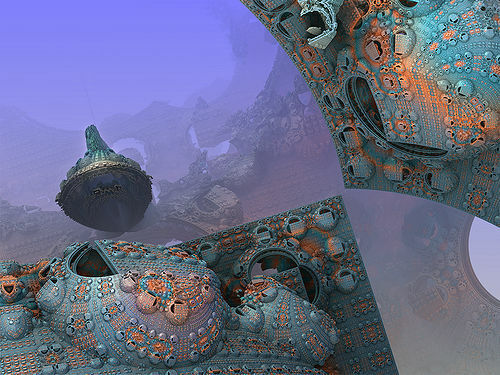 I followed a link from Mandelwerk’s Deviant Art page to these incredible mandelbox images by Janetino. Janetino has such unique color palettes. 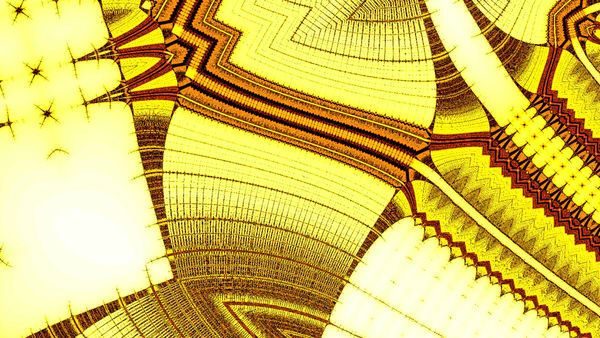 I’ve never seen any mandelbox images with this sort of coloring that looked so good. Nice use of the foggy perspective effect here too. This one is really something. So ornate and such unique color. The blue haze suggests sky and sunlight streaming into this ornate temple or ritzy spaceship. I’ve got to look around Deviant Art more. It’ll be worth it if I find another artist with such unique and well done work as Janetino. She’s up there with the other top “Mandelboxers” in my opinion. Here’s an interesting photo for two reasons: First, because it has such a dreamy, visionary, summer night, sky full of imagination and wonder look to it. 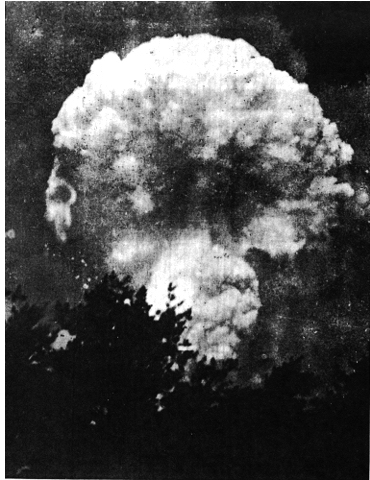 Second because it’s actually a photograph of the Hiroshima atomic bomb explosion taken, not from the air, but from the ground several miles away by a civilian who just happened to be in the right place at the right time. It dulls the golden glow of the photo’s dreaminess to know we’re also observing an event that killed over 100,000 people in less time than it takes to answer a ringing telephone. I wonder how many other attractive things in our world would look less appealing if we knew what we were really looking at? Texture was found on the Fractalforums.com gallery like many of the images here. The gallery contains (I believe) any images uploaded to the forum for any purpose, either artistic or as examples and illustrations in technical discussions. I can’t always tell what context the image appears in with respect to the forum postings, I just browse the image gallery in behind the scenes mode and comment on whatever catches my eye. 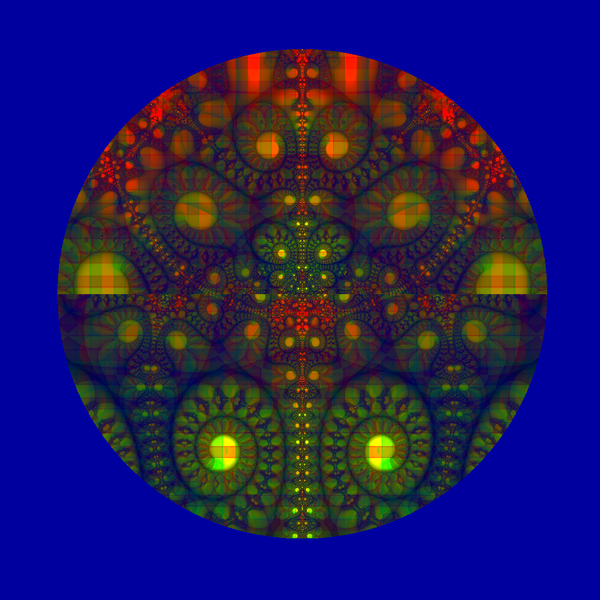 I like this one for it’s simple, classical fractal style. Sometimes less is more and this is a good example. This image has a real sense of style and stands out because of it. 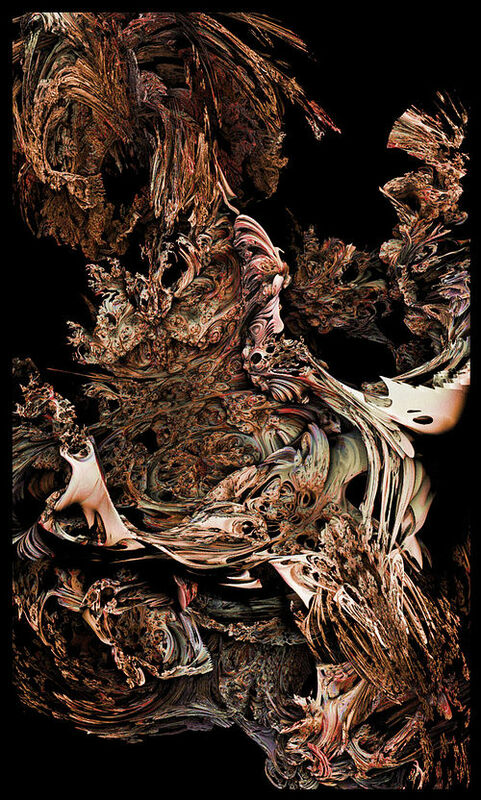 Just like Texture this image features imagery that isn’t new and cutting-edge like the mandelbox or mandelbulb and yet has real style and focuses on the more classical fractal type of imagery. I think this has an extra layer, a grid pattern over it and although that might seem rather simple the effect it has on the image is strong. It looks like it could have been taken off a vintage pulp sci-fi cover and maybe the author thought the same thing when he named it. This image really has to be seen in full-size which you can do by clicking on it. The mandelbox, like most fractals, is capable of producing a lot of imagery but it takes a good eye and some careful experimentation to produce something of interest amidst the deluge of images that pour out of the formula This one has a surreal look to it. Maybe it’s the ornate architectural appearance that makes the square “front desk” of the mandelbox lobby look real and therefore strangely out of place. The fact that it’s sunk below the horizon and hidden from sight enhances the eerie feel. I hear this Borg thing mentioned here and there but I don’t know what it’s about or what it’s from. 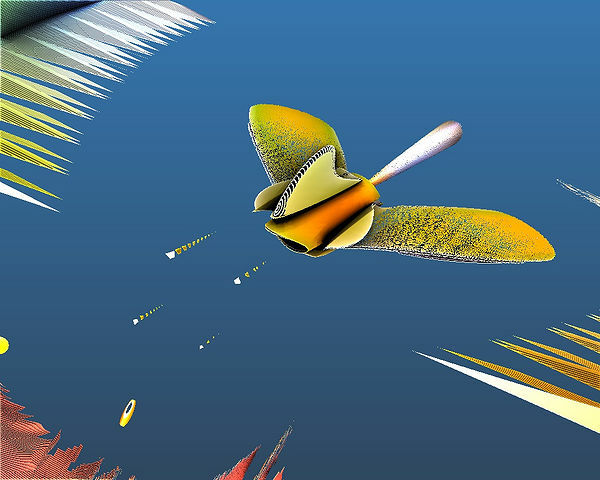 I find it odd that a Cyclops would be making 3D art, but maybe that’s just a screen name for L. Shone? There’s an MC Escher look to this and I like the careful, repetitive metallic detail in it. The hole in the center is a nice touch and shows us that the inside is remarkably no different than the outside. It’s got an old, engraved illustration appearance that I like. Another one that I’d call “classical”. 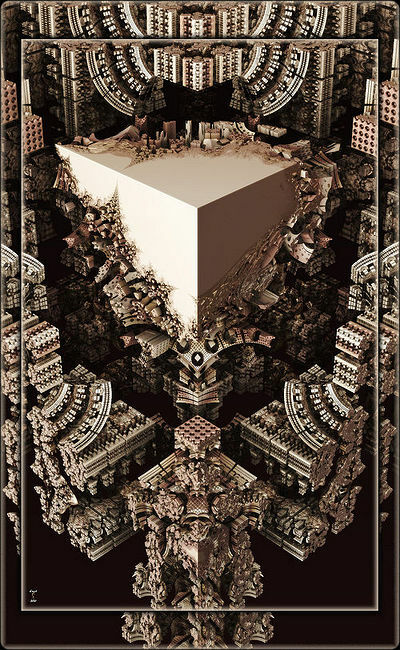 I guess I’m referring to fractal imagery that is single layer and was much more common back before multi-layered programs like Ultra Fractal came out. But… this one was apparently made with UF! I’ve always liked the shiny tubes and other orbit trap kinds of imagery that have an almost collage look to them. The abrupt transitions resemble cut paper but sometimes the tube forests stretch all the way to the horizon although they do look like the scissors lopped off their upper branches, swift and invisible. There can be a lot to see in these apparently simple images. Good art is like that. I check in on the Fractalforum.com gallery everyday. When I saw the first of these Orion images I frowned a little because it reminded me of when I first started out making fractal images in Sterlingware almost a decade ago. Later on, after seeing this one and especially the jagged, machine made elements surrounding it, I began to see the subtle but attractive style that these Orion images have. This is pure digital vision; it’s all machine made and it shines with a technological glow like only some bold new discovery in a laboratory can. The machine drew this and no human hand can imitate that cold, fractonic style. One last one. 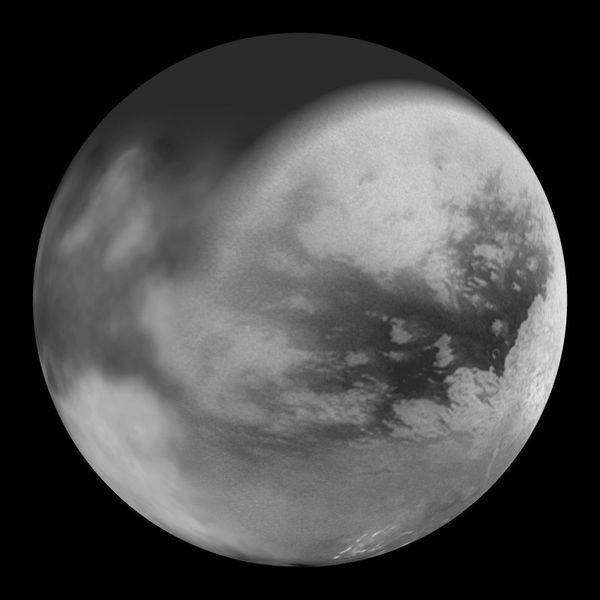 This is a real photograph of Titan, the largest of Saturn’s moons. I think it’s made up of several shots taken by more than one pass of the space probe although it lacks the jumbled, collage look of a composite photo. I’ve been using this image as my desktop wallpaper for almost a week, centered with a black background. I keep thinking it’s the opening shot from some vintage, 1950s sci-fi film that’s about to begin: Sinister Planet. Anyhow, those are the pieces of the puzzle. Maybe some of them don’t belong to the same big picture. Or maybe this puzzle is a lot bigger than the 10,000 piece label on the box says. We should have started building this on the floor instead of the table. You may wish to branch out a bit more within the FractalForums site. Many images are being made available which do not go through the Gallery option, but are entered directly within individual postings. And some are quite striking !!!! And as to the real name of “Cyclops”, only that person could really say for sure. I have seen too many other variations used, besides the “L. Shone” moniker. Nice collection in today’s blog, and I like your perspective. Yes, you’re right about branching out more. I just started browsing from the forum/thread side of things and I’ve seen some interesting things. The main thing I was missing by only looking at the gallery was video. It’s too bad the gallery section doesn’t include all images in the forum like an image directory for a website might. But I guess they don’t make forums for people who just want to look at the pictures. There are some very “mathematical” discussions going on over there. Someone could get a good education just following all the postings. Why Image files are very different than Parameter files: Derivative Works!